Our team believes that you should be able to take advantage of every feature that your vehicle has to offer, and that includes the luggage rack. 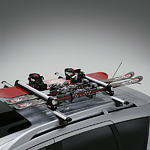 Improperly using the roof rack could result in damaged gear and dangerous collisions while out on the road. Every item that is placed on your luggage rack must be strapped down and anchored to multiple points on the vehicle. If your vehicle doesn’t have anchor points that are easily accessible, then you might want to invest in crossbars or a storage box. All of the straps, hooks, and fittings that you use should be specifically designed for outdoor use as well. The team here at Kia of West Nyack wants you to be as safe as possible every time that you hit the road. Please stop by our Kia service station location to have your vehicle serviced before your next road trip.